How Often Do You Pull Out Your Digital Cigarette? Contextual analytics is a useful tool for assessing effectiveness of your advertising efforts. Knowing when and where your customers are likely to view your ads can make or break your campaign, so it’s important to check the trends every now and then. People are social creatures. They like to get together and chat when they finish work or during weekends, be it at home, in another person’s home, in bars and restaurants, clubs, art galleries, etc. But people also do a lot of their communication and socializing on their smartphones. In fact, the smartphone has become every marketer’s best bet in terms of platform. 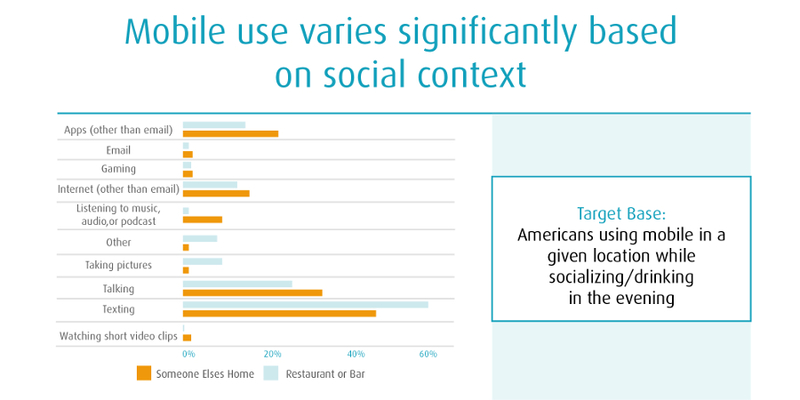 An analysis of over 50,000 days of cross-media consumer behavior has revealed that one of the most important contextual factors is social setting – specifically, how it impacts media behaviours. RealityMine has found that 36% of people visiting someone else’s home watch live TV or video-on-demand. In restaurants or bars, TV viewing is comparatively low, sitting at just 18%. But as one social observer reportedly stated, “cell phones are like a digital cigarette – people can play with it when they are waiting for friends, and it gives them something to do.” And it’s true. You can try and figure out the trends or you can just pour all your marketing efforts into mobile platforms. Anyone with even the smallest amount of purchase power and incentive owns a smartphone, and most smartphone owners are checking their device on an hourly basis. More aspects are to be considered in order to work out an optimal strategy – who they met with, what else they are doing, etc. – but simply knowing your go-to platform is enough to get the show on the road. When the “viewability” debate is cleared, you can focus solely on the content. So, how often do you pull out your phone for a “digital” smoke?